VOICE = SURVIVAL, an exhibition curated by Claudia Maria Carrera and Adrian Geraldo Saldaña for Visual AIDS, examines voice as a medium and a metaphor used by artists and activists confronting oppression amid the ongoing HIV/AIDS epidemic. The multidisciplinary exhibition features work and archival materials by ACT UP, Jordan Arseneault and PosterVirus, yann beauvais, Mykki Bianco and Adinah Dancyger, Chloe Dzubilo, Gran Fury, Andrea Geyer and Sharon Hayes, Guillermo Gómez-Peña and Gustavo Vazquez, Shan Kelley, Audre Lorde, Donald Moffett, Pat Parker, Bob Rafsky, Kameelah Janan Rasheed, Marlon Riggs, LJ Roberts, James Romberger and Marguerite Van Cook, Vito Russo, Kiki Smith, Ultra-red, Rosa von Praunheim, and David Wojnarowicz. Presented by Visual AIDS and the Shelley & Donald Rubin Foundation. Ultra-red's multimedia installation Untitled (for multiple voices), 2010, serves as a preliminary draft for a multi-vocal composition. It consists of a libretto of demands assembled from SILENT|LISTEN, a series of video and audio recordings of seven performances from 2005 to 2006. The performances were staged in a series of tactical occupations of major American art institutions. Collectively, they highlight how the arts serve as a crucial arena for open discussion and, in some communities, as the only public space to speak out about crucial societal issues. 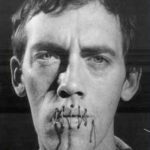 The exhibition also includes an archive selection of audio materials from the David Wojnarowicz Papers at the NYU Fales Library, engaging themes such as sound, death, temporality, memory, and voice. The archive includes personal answering machine tapes spanning from 1981 to 1992, sporadic personal “audio journals,” interviews of friends, and his performative readings of his own AIDS-related writing. In addition to the Wojnarowicz archive, audio recordings of speeches by Audre Lorde and Pat Parker, The Transformation of Silence into Language and Action (1977) and Where Will You Be (1979), respectively, trace the intersectional activism of queer women of color in the 1970s and 80s. Framing language as crucial to survival amid oppression, these works are mirrored by the text works of Chloe Dzubilo and Shan Kelley. In diverse ways, these sound and video works mobilize the power of the voice to communicate sonically, affectively, physically, and linguistically in the fight for individual and communal survival. The artwork and ephemera in the exhibition include posters, drawings, and text based works that play on the metaphoric implications of voicing vitality, agency, and subjecthood. Kameelah Janan Rasheed’s text-based prints from How to Suffer Politely (And Other Etiquette), 2014, blend satire and societal suppression to, as Rasheed states, “explore how suffering, anger, and responses to trauma are policed to ensure that said expressions of suffering do not disrupt or declare accountable oppressive systems.” The implications of suffering in silence are also evident in Donald Moffet’s poster He Kills Me (1987). Moffet made the poster depicting President Ronald Reagan as part of ACT UP’s demonstrations against his 1987 Presidential Commission on the HIV epidemic, which was widely criticized by activists for the Commission members’ demonstrable lack of expertise. In LJ Roberts’ embroidered work Portrait of Deb (1988-199? ), 2012–2013, Roberts draws from an archive containing activist buttons, stickers, and other articles belonging to their friend's former partner who participated in ACT UP, the Women's Health Action Mobilization, and the Lesbian Avengers from the late 1980s to the mid-1990s. Compiled and sewn together in Roberts’ work, they illustrate the intersectional politics active during this era. 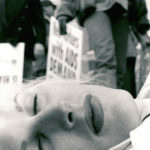 By exploring the vital importance of the voice in both art and activism surrounding the fight against HIV/AIDS in the US and Canada, VOICE = SURVIVAL reveals the capacity of vocal protest to turn isolation into connection, impotence into agency, oblivion into memory, and extinction into survival. Ultimately, the exhibition highlights the potential of voice to confront the bio-political crises of the present. YOUR SILENCE WILL NOT PROTECT YOU: ON AUDRE LORDE & DAVID WOJNAROWICZ with Cleopatra Acquaye-Reynolds, Anneliis Beadnell, Pamela Sneed and Marvin Taylor. MARLON RIGGS & “No Regret”: DISCLOSURE, PERFORMATIVITY & LEGACY with Kiyan Williams, Ni'Ja Whitson, and Tavia Nyong’o. CURATOR & ARTISTS TOUR with VOICE=SURVIVIAL curators Claudia Carrera and Adrian Saldaña and participating artists Jordan Arseneault, Kameelah Janan Rasheed, LJ Roberts, James Romberger, Marguerite Van Cook, Robert Sember (Ultra-red) and James Wentzy. Visual AIDS is the only contemporary arts organization fully committed to HIV prevention and AIDS awareness through producing and presenting visual art projects, while supporting artists living with HIV/AIDS. Visual AIDS is committed to preserving and honoring the work of artists with HIV/AIDS and the artistic contributions of the AIDS movement. Capturing critical and audience acclaim, Visual AIDS' art exhibitions examine the deep cultural history of the AIDS crisis and contemporary issues around HIV/AIDS today. Exhibitions are organized by guest curators and feature a range of emerging, international and HIV+ artists. 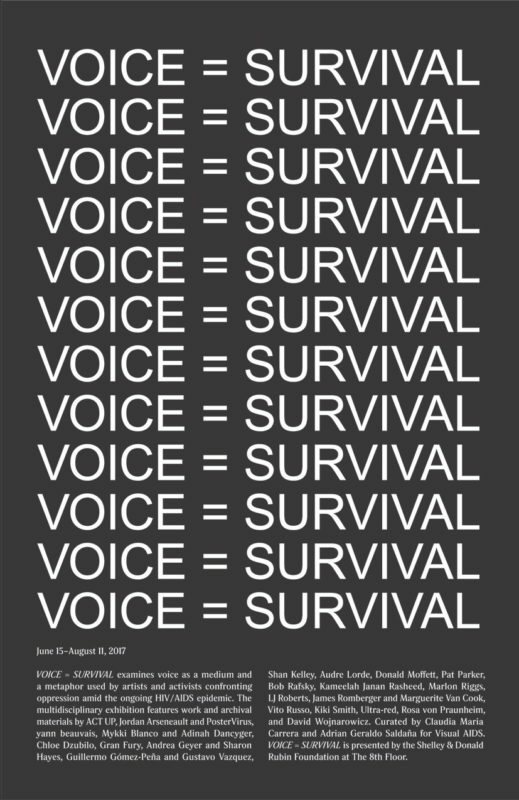 VOICE=SURVIVAL was selected for The Shelley & Donald Rubin Foundation exhibition from a competitive call for proposals. Claudia Maria Carrera is a doctoral student and graduate instructor in the Department of Music at NYU working in sound studies, media studies, and performance studies. 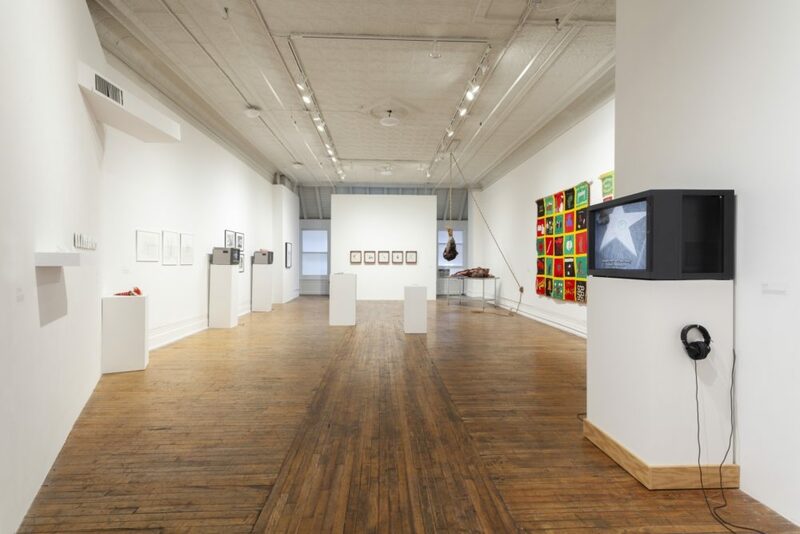 The exhibition VOICE = SURVIVAL grew out of her dissertation research, which examines the mobilization of the voice as a medium and a metaphor in the early years of the NYC AIDS crisis as a queer survival practice. At NYU, Claudia has co-curated the Music Department Colloquium Series and has served as a shop steward and unit representative for GSOC-UAW 2110, the first graduate employee union at a private university in the U.S. Claudia has also worked as a stage director for theater and opera, including as a Resident Artist director for the Opera Theater of Pittsburgh, and has written about music, arts, and culture for Capital NY and for the Tanglewood Music Festival, where she served as a Publications Fellow. Claudia lives in Astoria, Queens and holds degrees from NYU and Princeton University. 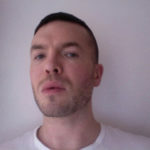 Adrian Geraldo Saldaña curated numerous exhibitions and public programs while working at the Abrons Arts Center of Henry Street Settlement and a Project Booth at NADA New York 2014. He served as a Fellow in NYFA's Emerging Leaders Boot Camp and a Prevention Justice Fellow in the Community HIV/AIDS Mobilization Project (CHAMP). Adrian has also worked at the Streetwork Project LES, a needle exchange program serving homeless and street-based youth, and the Harm Reduction Coalition, a national organization founded by needle exchange providers, advocates and drug users. He was a member of Queer Fist, a radical queer collective formed to disrupt the 2004 Republican National Convention in New York City. He holds a Master of Public Administration from the NYU Wagner School of Public Service. Originally from Houston, TX, Adrian lives in Brooklyn, NY.